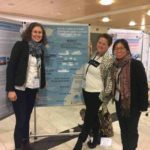 This past week, Dorothy Dankel, Yajie Liu and Rachel Tiller have represented the REGIMES project at the annual Arctic Frontiers conference in Tromsø. 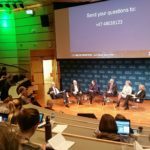 The first two days were filled with Arctic policy and politics plenary sessions, where Norwegian Prime Minister Erna Solberg and Norwegian Foreign Minister Børge Brende were top names. Dorothy presented the REGIMES project in the “Future Fisheries” session on Thursday in a keynote slot, and then the REGIMES team had two hours of conversation and dialogue about climate change, models and society around the REGIMES poster at the Poster Session. 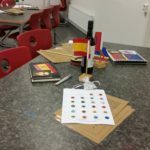 On Friday, Dorothy and Rachel observed a climate role-playing game with high school students from the Troms region, and got to talk one-on-one with educators and students about local activism and the role of critical thinking in politics. We also became more aware of the other Norwegian-led projects on climate change and fisheries, including STOCKSHIFT through a discussion with Olav Schram Stokke at University of Oslo. REGIMES will follow up! All in all a very pleasurable and constructive week in Tromsø!